What exactly is Fluorescent Microscopy? A fluorescence microscope uses fluorescence and phosphorescence instead of (or sometimes in addition to) reflection and absorption to study properties of an organic or inorganic substance. The stereo fluorescence microscope illuminates a sample with light of a wavelength which excites fluorescence in the sample. 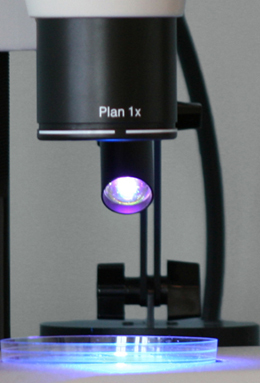 The fluoresced light, which is usually a longer wavelength than the illumination, is then imaged through a microscope objective and two filters are used - the illumination (excitation) filter which ensures the illumination is near monochromatic and at the correct wavelength, and a second emission filter which ensures none of the excitation light source reaches the detector. In most cases, the sample of interest is labeled with a fluorescent substance called a fluorophore and then illuminated through the lens with the higher energy source. The illumination light is absorbed by the fluorophores (now attached to the sample) and causes them to emit a longer, lower energy wavelength light. This fluorescent light is then separated from the surrounding radiation with filters designed for that specific wavelength, allowing the viewer to see only that which is fluorescing. The basic task of the fluorescence microscope is to let excitation light radiate the specimen and then sort out the much weaker emitted light from the image. First, the microscope has a filter that only lets through radiation with the specific wavelength that matches your fluorescing material. The radiation collides with the atoms in your specimen and electrons are excited to a higher energy level. When they relax to a lower level, they emit light. To become detectable (visible to the human eye), the fluorescence emitted from the sample is separated from the much brighter excitation light in a second filter. This works because the emitted light is of lower energy and has a longer wavelength than the light that is used for illumination. Whether working with C. elegans, drosophila or zebrafish, developmental biology depends on stereo fluorescence to sort eggs or embyros that have been tagged with a specific marker called a fluorophore. 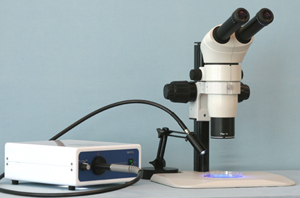 Typically stereo fluorescence microscopes are expensive and therefore shared within a lab or facility where time is rigidly scheduled and many users can be accommodated. Microscope World has developed a less expensive alternative which requires no compromise in quality and allows use of an existing stereo microscope for stereo fluorescence. Many stereo microscope systems can be adapted into a stereo fluorescence microscope, resulting in quite a cost savings, but sacrificing no quality when it comes to fluorescence. Additionally, the new SXT500 comes available from Microscope World either as a complete system, including a high quality common main objective stereo microscope system, or as an illumination system you can use with many models of dissecting microscopes. If you are interested in getting information on adapting your existing stereo microscope for stereo fluorescence contact us.